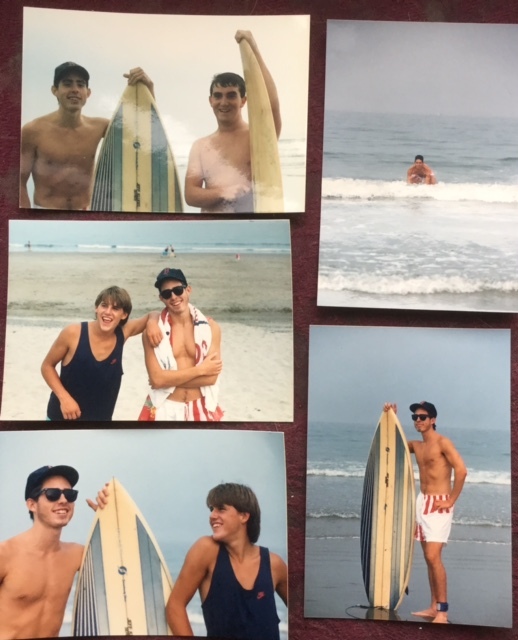 I have been sorting my box of nostalgia, looking for clues to what went horribly wrong, and I came on these surfing photos from what I think is the summer of 1988 because I bleached my hair blonde a year later. '88 was a classic summer of pure bohemian insanity. Notice the crystal clear sky and bright sunshine of New England! And the huge waves with nice point breaks of Northern Atlantic? Just begging to be surfed. Ha! I've seen bigger waves in a lake. I always wore my Red Sox hat, even surfing. Everyone adored me, though. Mr. Kodiak at top left and J.J. The Lady Killer bottom left. The waves broke, literally, in 14 inches of water. And the 'wave' was only a wave for maybe 3 seconds, after which it became white froth and the fins of the board would dig into the sand and pitch the rider forward onto his bean. What went wrong? Well, I never learned to surf. I definitely found better surf spots, but I am not a huge fan of swallowing gallons of radioactive, polluted salt water. Call me crazy. We move on but I have no problem looking back. One thing that I pine for is my collarbones and shoulders that had not yet been separated. When I separated my collarbones (both collarbones) and also separated my right shoulder on an epic trip to Alaska I became permanently deformed. Only the most recent two years of rehabilitation of my spine and shoulders has me at a point where I can reach over my head and sleep without pure agony. Back in 1988 I had no problem sleeping. Now I gotta apologize for being a cripple with chronic neck pain. Oh, pardon my selfishness while I move to Mexico to rehab my deformed spine!